Columbia has long been recognized as a great place to live the good life. Case in point: Money Magazine named Columbia the #1 place to live in 2016, not just in Maryland, but in the entire country. And for good reason. Columbia comprises 10 villages that are home to diverse businesses, vibrant economies, some of the nation’s best schools, and an idyllic location that’s close enough – and far enough – from the hustle in Baltimore and DC. Enter Alister Columbia, a gem of an apartment community located in the heart of Kings Contrivance Village. Here, you’re awesomely close to huge employment hubs just off of I-95, great shopping, dining, and, of course, the aforementioned award-winning schools. From Starbucks runs to your morning commute, getting around town is easy from Alister Columbia. It’s the best of connected living. 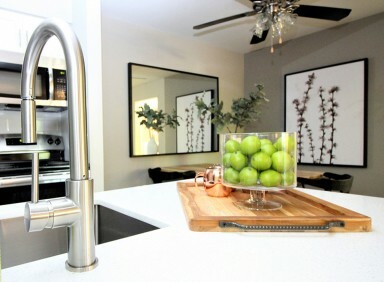 Our Columbia, Maryland apartment homes have received the royal treatment with a full-scale redesign including newly redesigned kitchens, stainless steel appliances, quartz counters, new lighting and fixtures, and vinyl wood flooring in select homes. Finishes are designed to be on par with brand-new apartments on the inside, where they count. The amenities have also received the Alister once-over and include an updated clubhouse, which offers hang-out-worthy spaces, free Wi-Fi, and coffee bar. Telecommuters rejoice – this is some great work-from-home space. The pool area is always the heart of any community, so we’ve given it some serious love with new lounging. We also focused on the center of your workouts by redesigning the fitness center with all new equipment. As part of the Alister collection of apartments by Mill Creek Residential (only one of the most respected apartment companies in the country), Alister Columbia’s team is trained to be friendly experts, with the know-how to help you find the apartment you want – and make sure you’re happy long after you move in. So, exhale. We’ve got this. Best of all, you can have the location, the apartments and high-touch service at Alister Columbia – all at a great value. Connect with us to see what life is like at Alister Columbia. Leasing one-, two- and three-bedroom homes. One is just right for you. Now Leasing at Alister Town Center Columbia. One of Columbia's Best Kept Secrets.